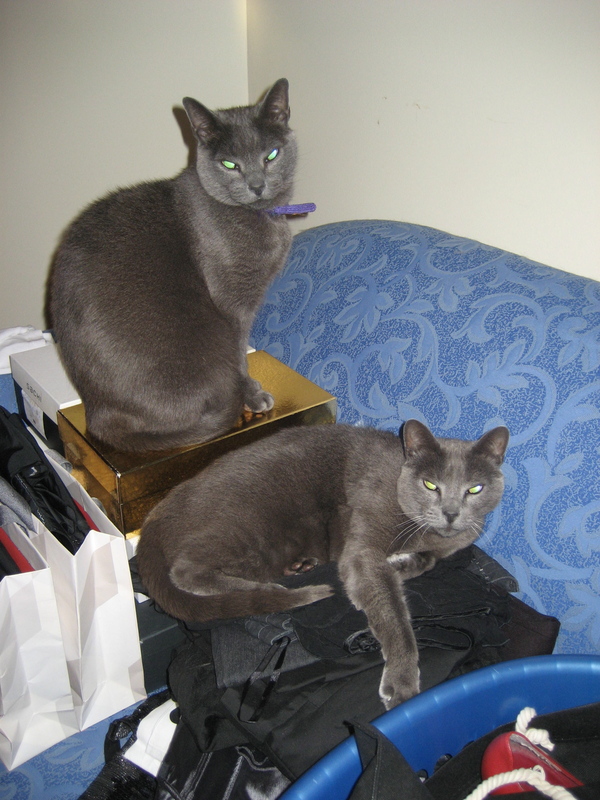 Today my Russians, Max and Misha, turn 9. I can still remember the day I got lost driving to Penrith (from Canberra) to collect them from the breeder. It was the first time I’d driven anywhere outside of Canberra or Darwin. But after several phone calls, I found the right house and brought my little boys home. Misha went to live behind the washing machine, while Max soon became Mad Max because of his dashing from one place to another around the house. Neither of them do much dashing these days. Misha lives under my Nanna’s chair or under the doona. 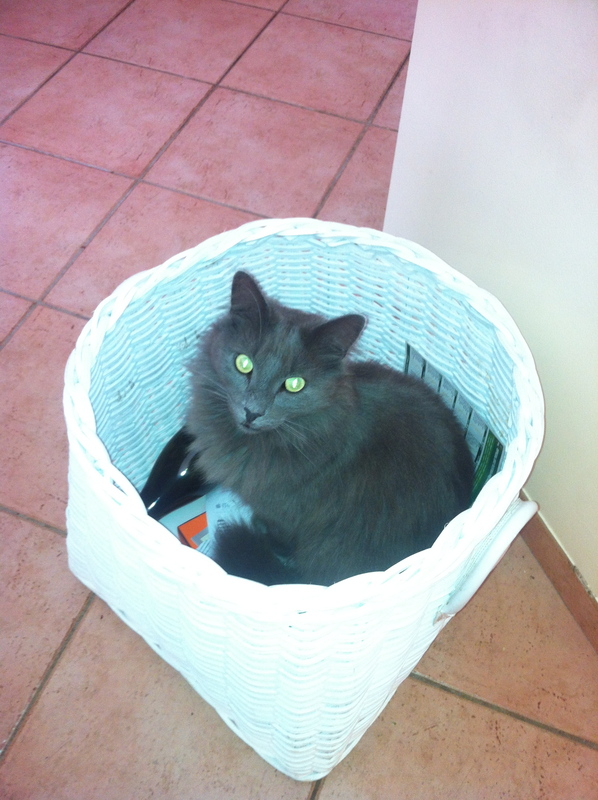 Max spends most of his days on the Foxtel machine. But they are still my lovely boys. Happy birthday Max and Misha. That is all. Poor Bubba. One night this week I came home from work to find Lilly curled up on the couch, rather than stalking impatiently by the internal garage door. I noticed, but thought little of it. As usual, I put down my handbag and opened the pantry door to get the cat food. Lilly remained on the couch, and this unsettled me. I served up the tinned food, keeping one eye on the disinterested Lil and rationalised that she was protesting. So I served up some kangaroo meat as well. I’d already been to the couch a couple of times to pay homage and enquire as to her day. This time I went over, asking whether she was protesting. Lilly rolled onto her back for a tummy rub and it was then that I accidentally touched one of her back legs. As I may have mentioned before, Miss Lil has a deep forbidding growl. This growl was emitted when my hand grazed her leg, and it was then I knew for sure that something was wrong. Immediately, scenes flashed in my mind of squealing wheels and Lilly getting clipped by one of the neighbourhood hoons. I placed Lil on the floor and she gingerly walked over to the food but wouldn’t eat. Her attempt to jump back on to the couch was unsuccessful. So, after a couple of phone calls Lil and I were on our way to the emergency vet hospital, the bills for which are easiest to pay in gold bars. Lill serenaded me with her “I hate the car” yowls and a couple of times while changing gears I nearly lost my hand to grasping claws flashing out of the kitty carrier. 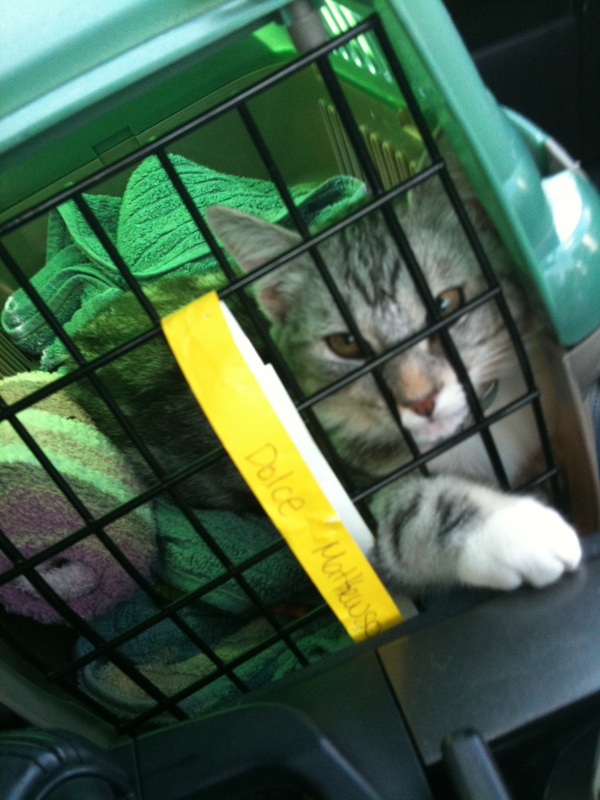 Once we’d arrived at the vet hospital, we were placed in a queue according to triage. A little black kitty, no bigger than my hand and consisting mostly of green eyes and a fuzzy tail was being examined for a scratched face. Next to arrive after us was Jerry, a 16 year old Jack Russell who’d just had a stroke. Jerry’s owner knew his little mate was on the way out but was doing his best to be brave. He was a big, blokish bloke and it broke my heart to see him cuddle little Jerry and whisper reassurances to him. Next to arrive was Steve, a liver and white coloured Setter who’d eaten something he shouldn’t have. By this time, Miss Lil was sitting up in her travel box, silently alert to the dogs in the room. I noticed she was sitting on the leg that was earlier causing her distress and thought it was a good sign. We humans chatted for a while, despite being strangers, sharing information about our pets and why we were there. Jerry was bustled in to see the doctor first, and about half an hour later his owner emerged clutching an empty towel. I wanted to hug this bear of a guy, but the evening’s earlier camaraderie had fled, leaving us to mumble inadequate apologies as he paid the bill and left. Lil and I were shown in to see the doctor next. At first we couldn’t even find the spot where her legs were damaged, and when placed on the floor of the examination room, inquisitive Lil jumped up on to the bench. That ruled out any broken bones. Further examination elicited the now familiar “don’t touch that” growl and identified the bruised and bitten spots on her back legs – the result of fighting with other cats. Miss Lil was given two injections, antibiotics for the bites and pain relief for the bruises. I handed over my gold bars, bade farewell to Steve and his owner, and headed home. I was warned that Lil would be a little woozy from the painkiller, but she seemed completely zonked when we got home. She was sitting in the middle of the kitchen floor when I went to bed, but ten minutes later when she had not joined me I got up again to find her sitting in exactly the same spot. So I carried her to bed and she slept all night in her usual spot, curled like a croissant in the crook of my arm. 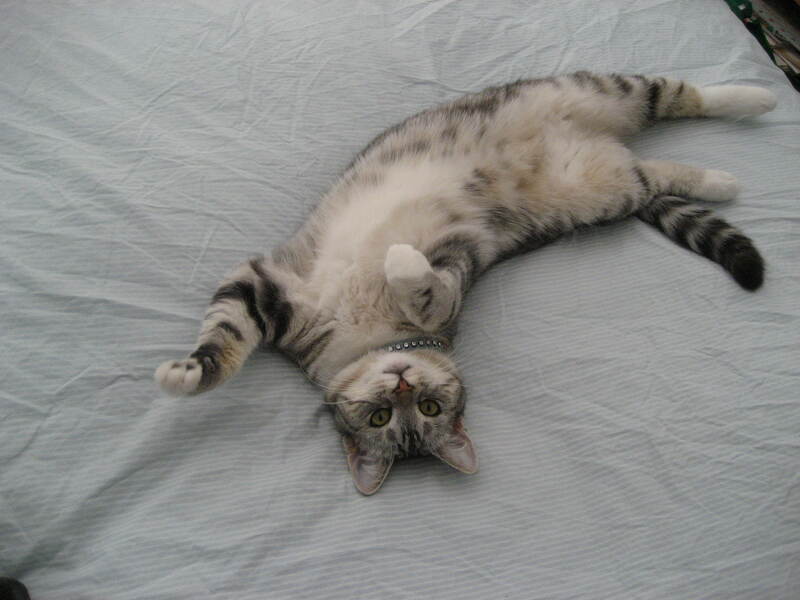 Next morning Lil was her normal chirrupy self, demanding breakfast and tummy rubs. As I performed my duties I though again of Jerry, and was grateful for being granted more time to spend with my pretty girl, also known as The Boss. Miss Lilly is fierce, there’s no other way of putting it. Not nasty, bitey or scratchy, just fierce. I’ve watched her make three male cats, all substantially bigger, back away from a bowl of food because she stood her ground and growled until they did. The ominous noises she makes while crunching a defrosted chicken wing would convince anyone that she killed it herself. And each time someone parks outside our house or knocks on the door, she runs up to the door and growls (before disappearing out the window). So she is our mini tigress, appropriately adorned with tabby stripes. Lately, Miss Lil has discovered birds in the trees that line the back fence. At least one of these unfortunate souls has been brought into my house, but thankfully not while I was there. It was my job however to clean up the feathers. Last Saturday, it was a glorious day and Lilly spent it under the bird-tree. Much to her disappointment, none of the bounteous produce fell to the ground before her. Today, it is miserable, wet and cold. 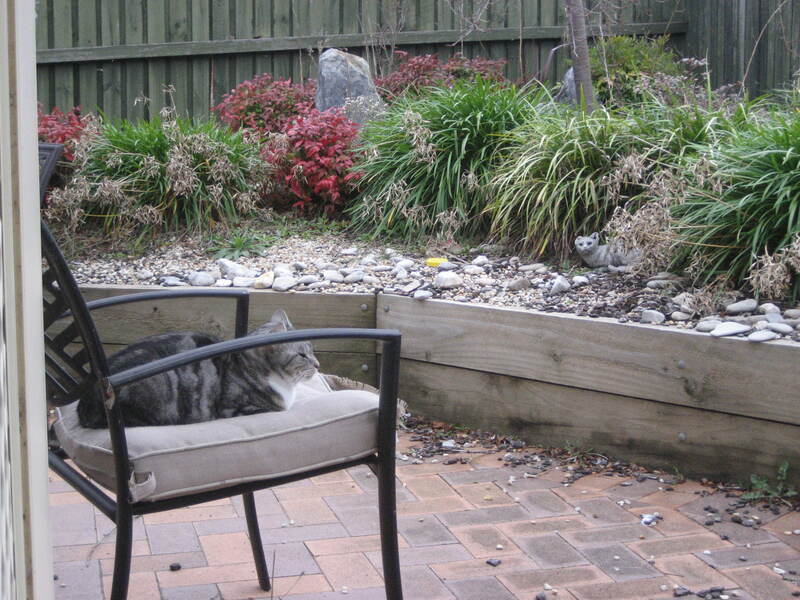 But Lilly continues her surveillance of the back yard, ever hopeful that an unwitting bird will cross her path…. 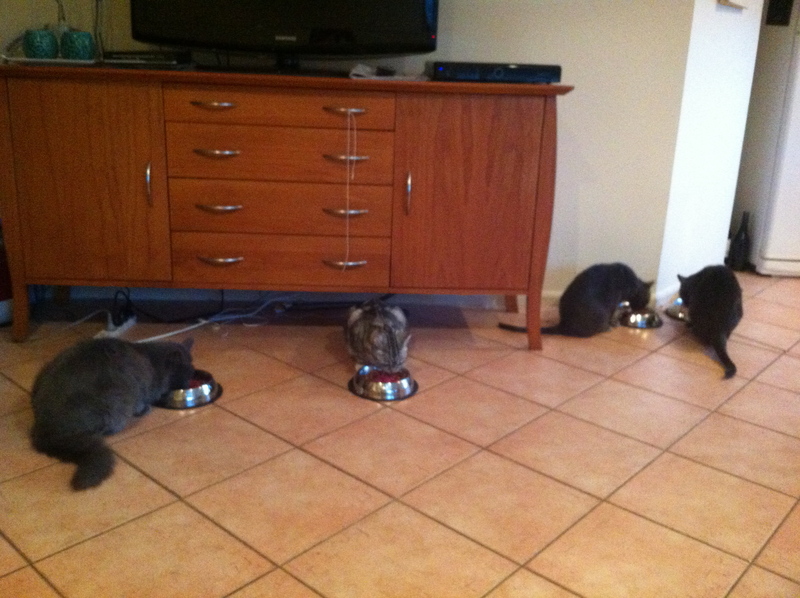 You wouldn’t think that cats would need a different dinner setting dependent upon what they’re eating, but mine do. Well, let’s say that ONE of mine does: Miss Lilly. Being the fierce tabby that she is (I have no doubt she was a tigress in a previous life), Lil becomes extremely territorial when fed fresh meat. So much so that she’ll growl like a wild thing even when eating mince. But recently I’ve discovered little fresh meat packets at the supermarket, and they’ve proved to be a big hit with my furry masters. Their humble servant: this is the role I’ve come to accept as the “owner” of four cats. On weekdays I can also be referred to as “the expensively dressed maid”; the one who ensures that all furry masters are happily chomping on their dinner before I allow myself to pee, get changed into trackies, or pour that first glass of wine. Depending on the number of cats you have, there might be some social implications. If you have one cat, you’re just a guy who has a cat. 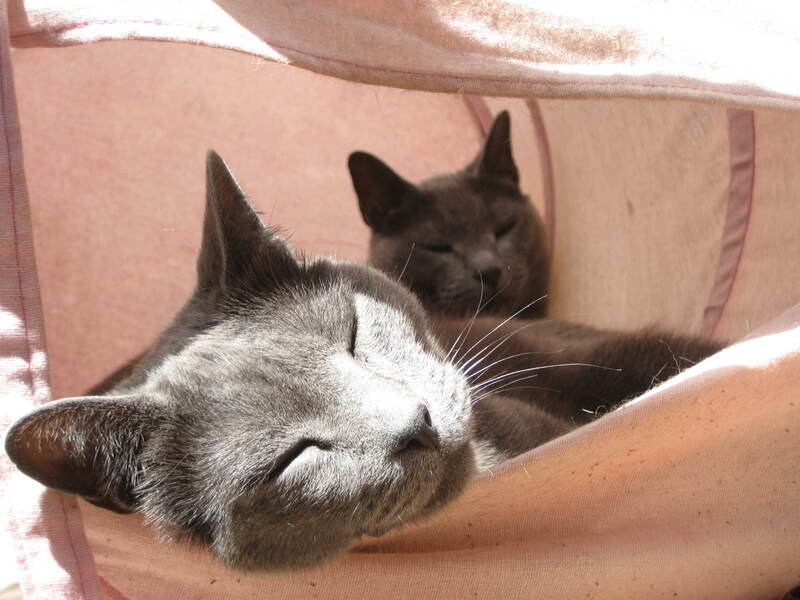 If you have two cats, well the two cats are friends, so they can keep each other company. 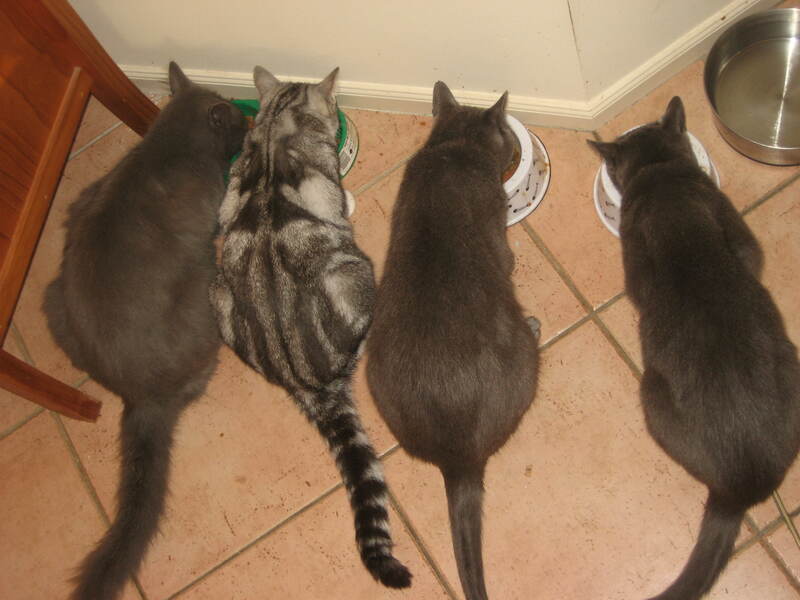 When you have three cats, you start to get to be that guy who has all those cats. Well I have four cats, so I’m pretty sure that makes me a crazy cat lady. And I wouldn’t have it any other way. This blog is a place where I can record all the ridiculously wonderful things my cats do, and post hundreds of photos without boring everyone on Twitter and Facebook to death. I hope you enjoy it.